Eight more years and over 4300 new pages of the Brevard News have been digitized and added to DigitalNC, courtesy of our partner, the Transylvania County Library. 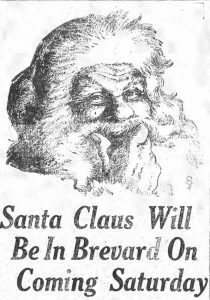 Previously, issues of the Brevard News only covered from 1917 to 1923, but DigitalNC now includes January 1924 through December 1932. This means that DigitalNC now contains digitized versions of the entire run of Brevard News, from its beginning to when it folded in 1932. It joins fellow Transylvania county newspapers the Sylvan Valley News, The Echo, and The Transylvania Times. Much of the articles cover local news, including residents of note and local politicians, events that were happening at the time, and advice for farmers in the area. 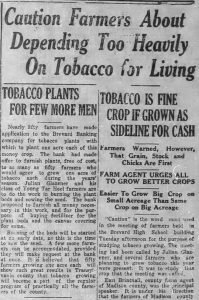 For example, in early 1930, the Brevard Banking Company announced it would help fund 50 farmers to plant one acre of tobacco each in order to bring money into Transylvania County, like it did to nearby Madison County. However, local farm agents cautioned farmers not to get too carried away with profitable tobacco farming, and to focus on grains and other existing crops first. To browse through other materials from the Transylvania County Library, take a look at their partner page, or check out their website.